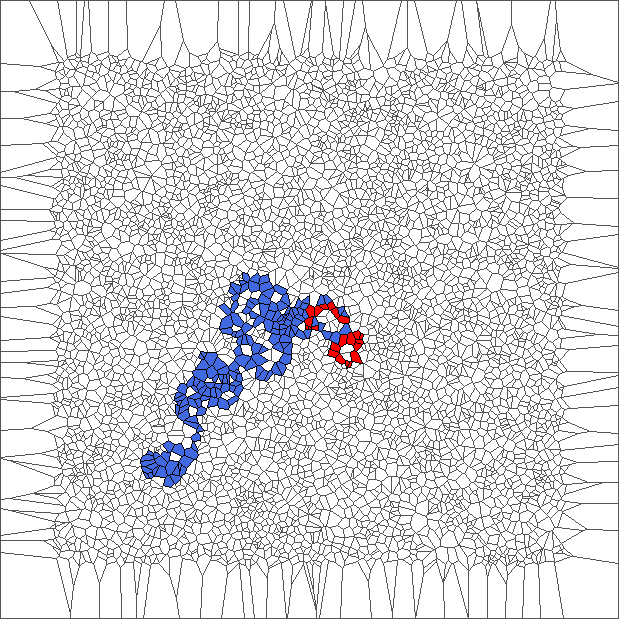 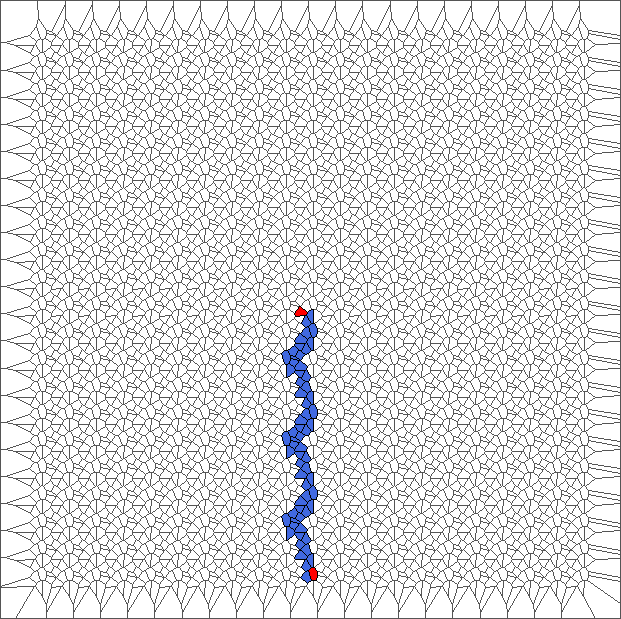 If the cell is red: Turn to the left, color current cell in blue, and move forward. 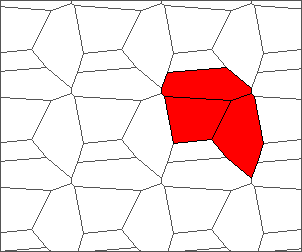 Given a finite set of points of the plane, we apply a Voronoi teselation with Euclidian distance. 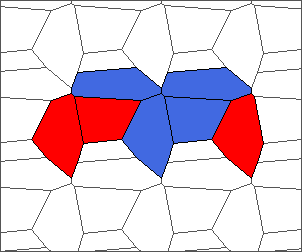 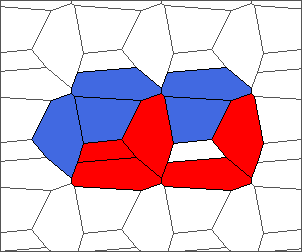 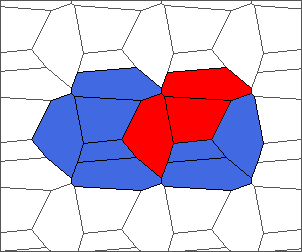 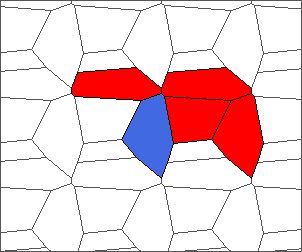 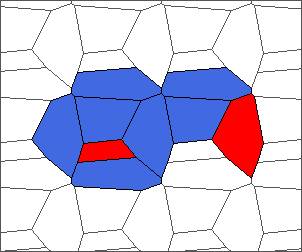 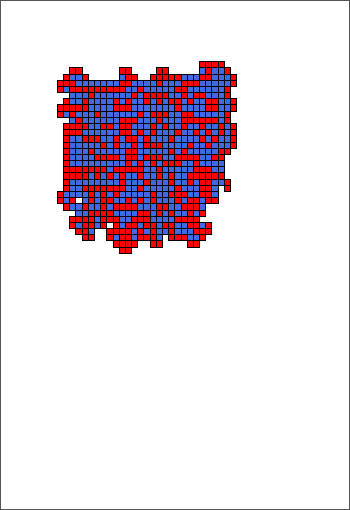 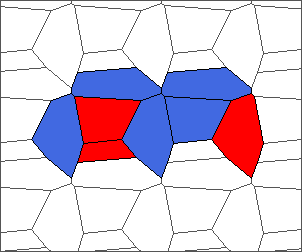 We obtain a partition of this plane into convex polygonal cells. 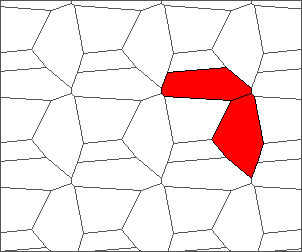 Here is the definition for a general polygon. 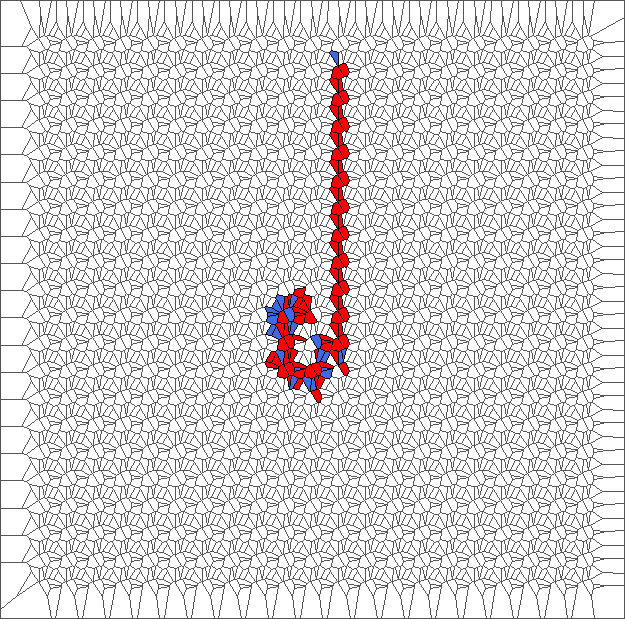 Given previous cell and current cell, we obtain the direction of the ant (red arrow) and of the last edge crossed (bold edge). 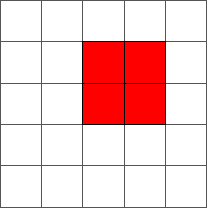 Relative to this direction, we number edges from 1 to E (where E is the number of edges of the current cell). 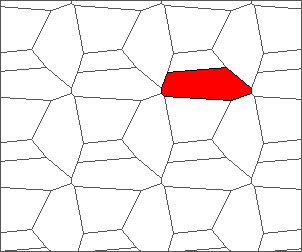 B is edge 1; S is edge 2; R is the median edge minus one; F is only defined for even polygons and is the median edge; L is the median edge plus one; P is the last edge. 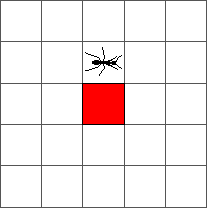 For example, each cell of the classic Langton’s ant is driven by alterning “going right” (R) and “going left” (L). 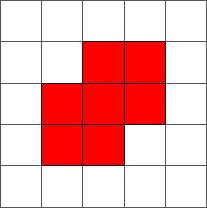 We summarize this scheme using the word RL. 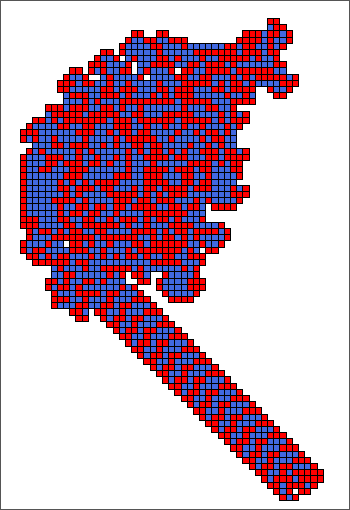 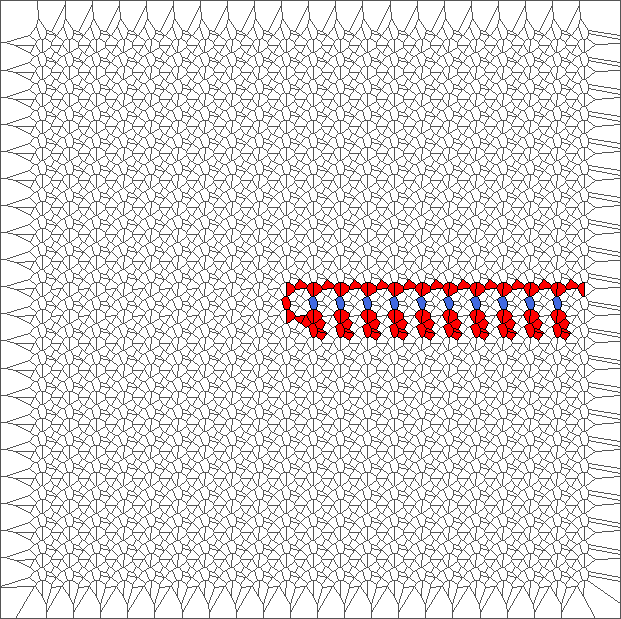 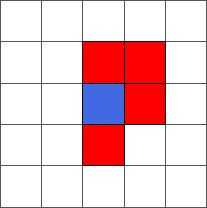 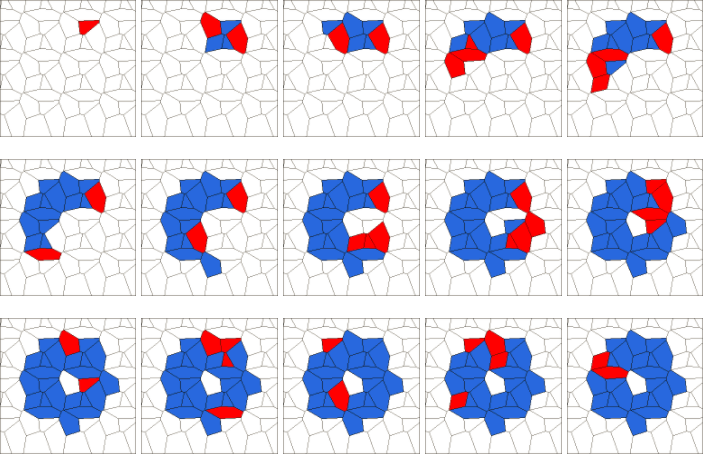 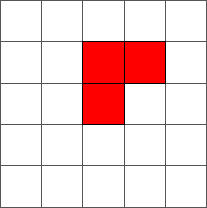 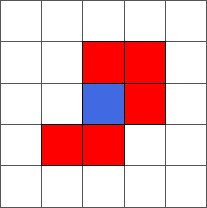 Note that in this case, since each cell has four edges, the rules SP, RL, SR and SL are all identical. 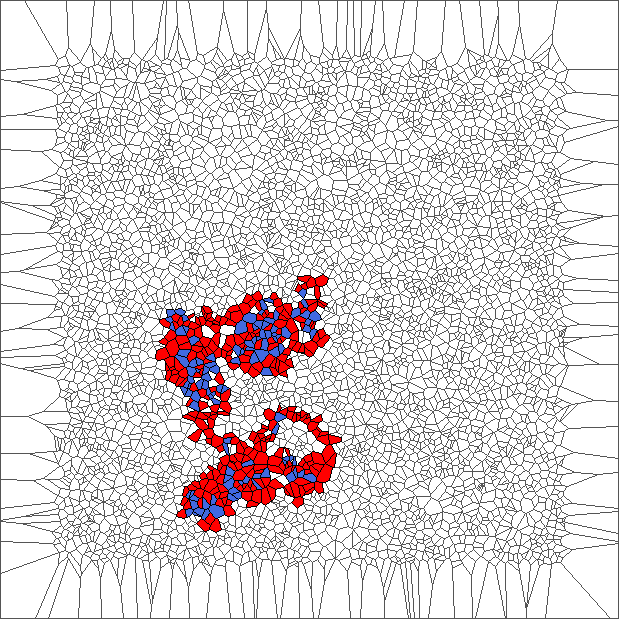 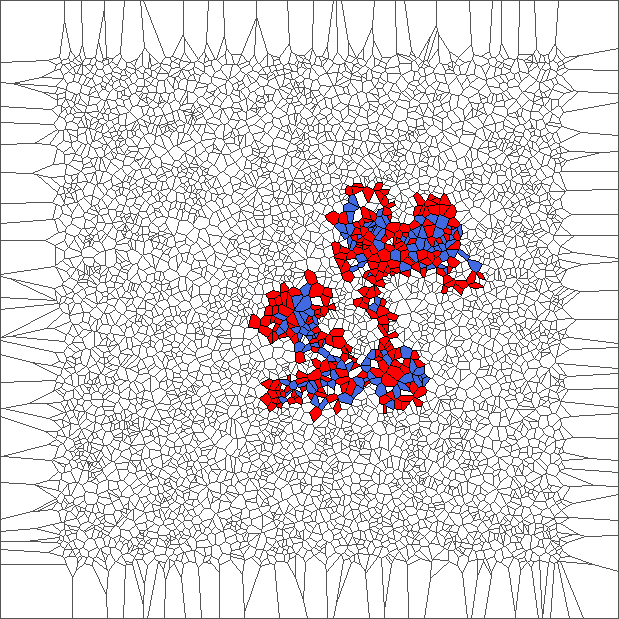 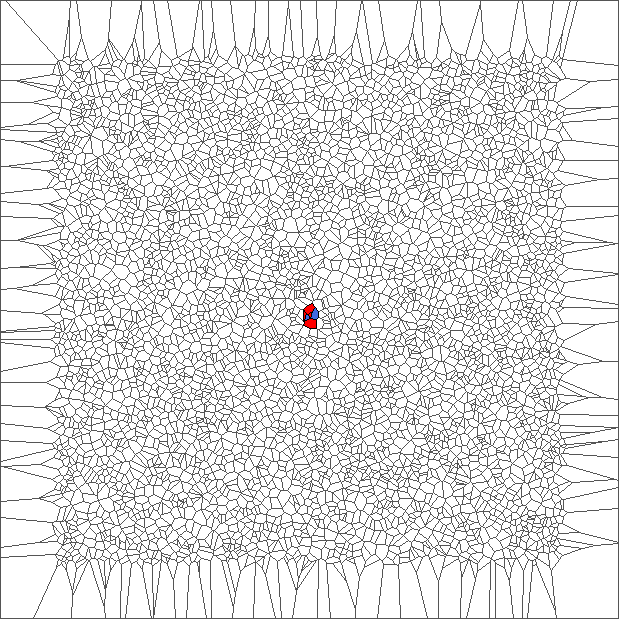 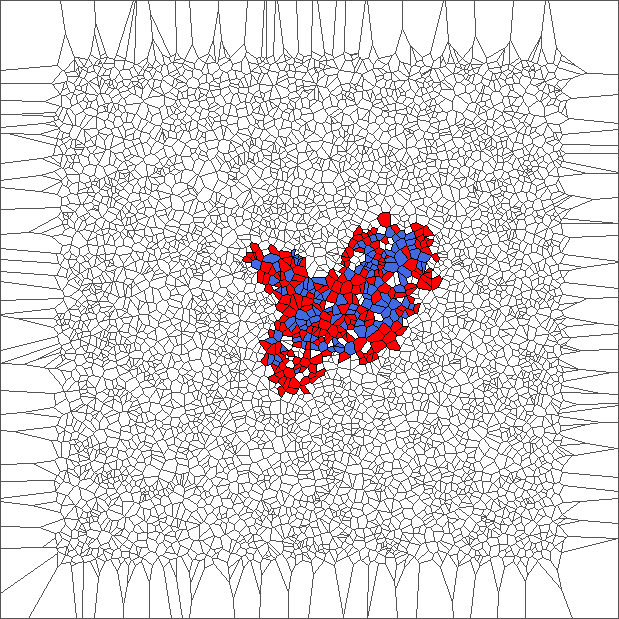 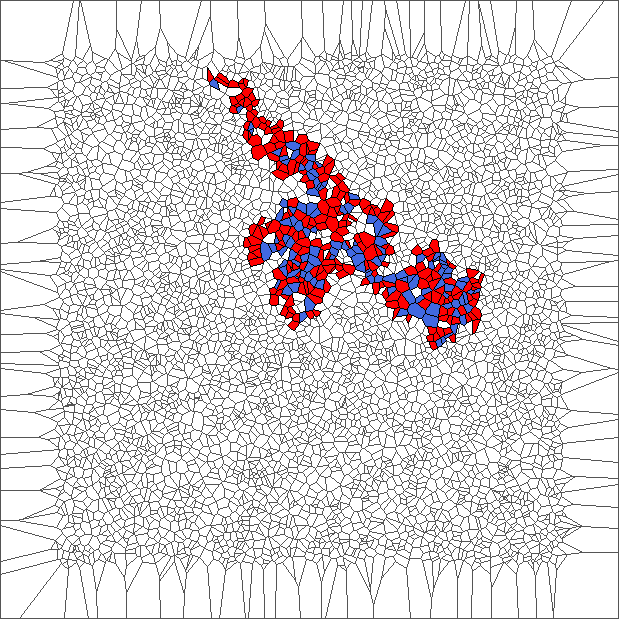 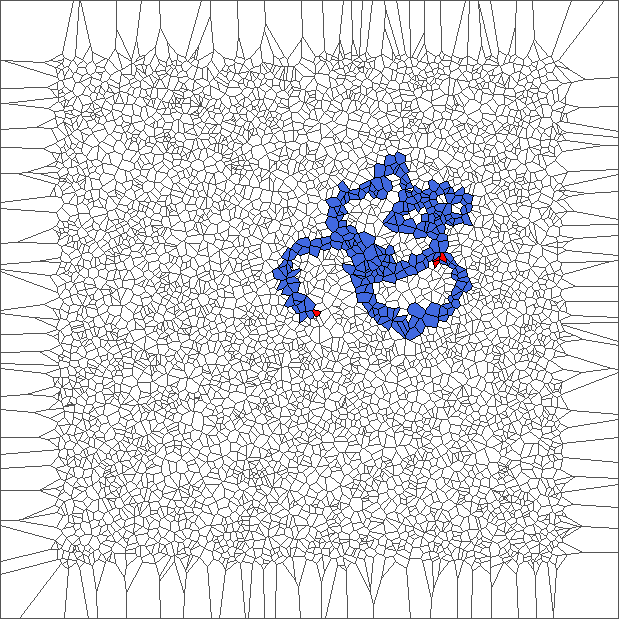 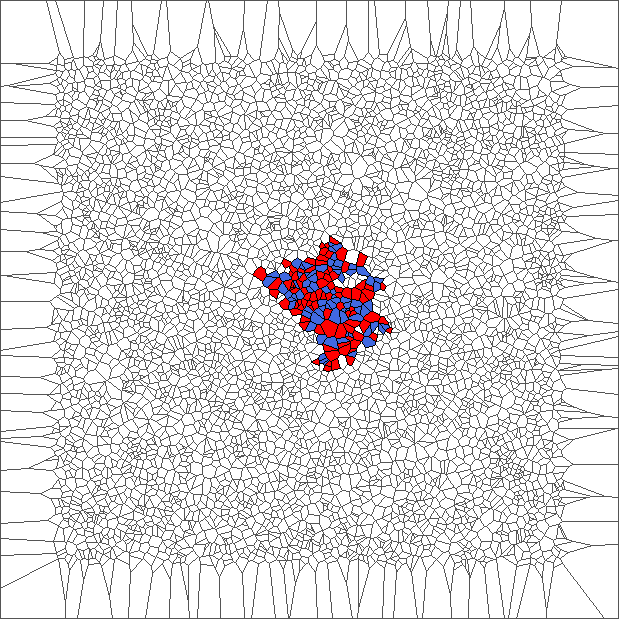 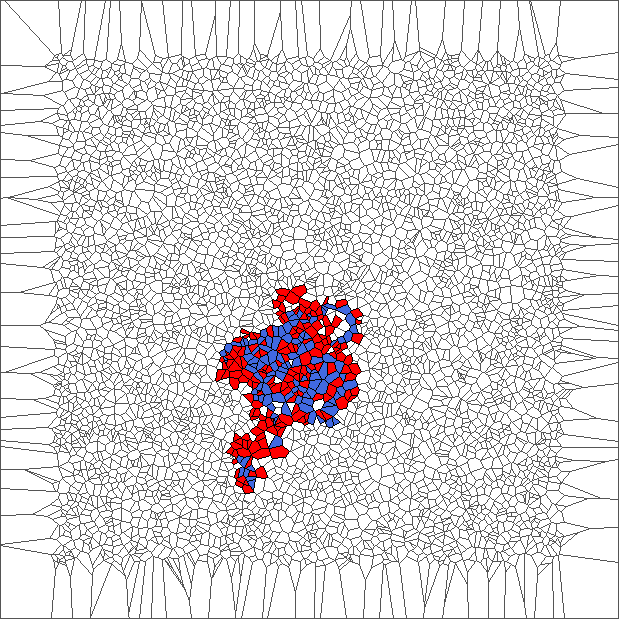 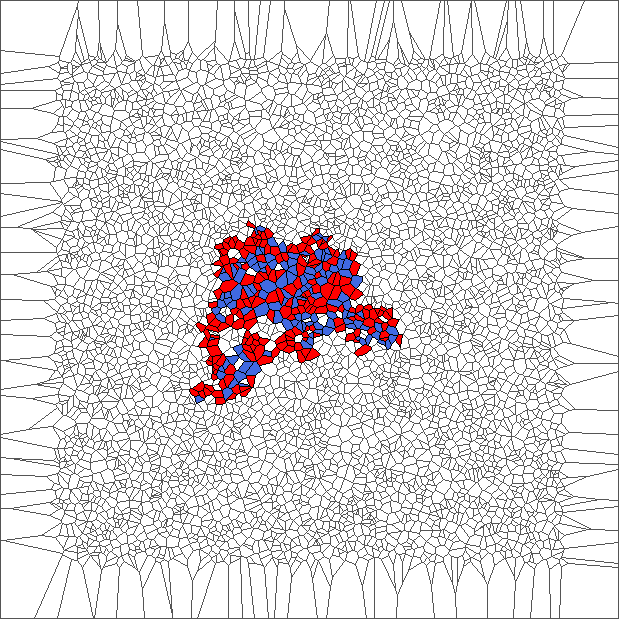 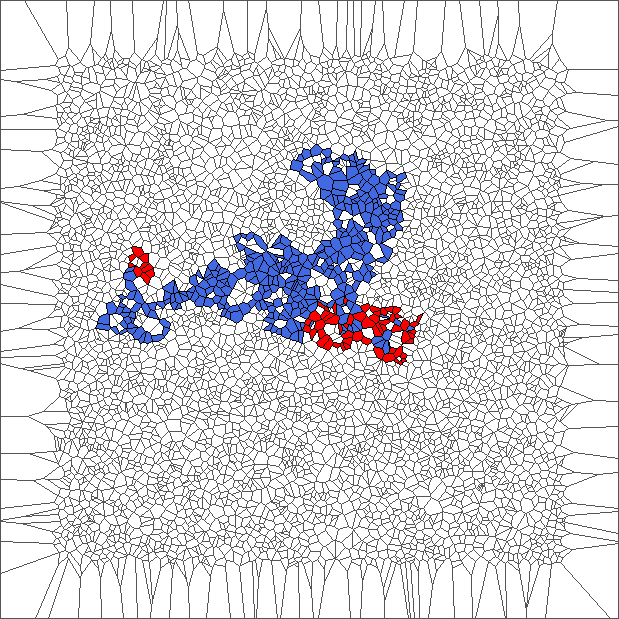 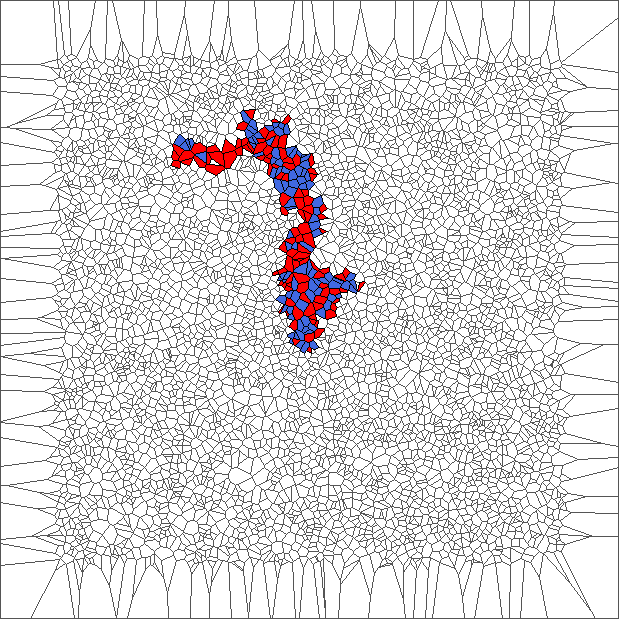 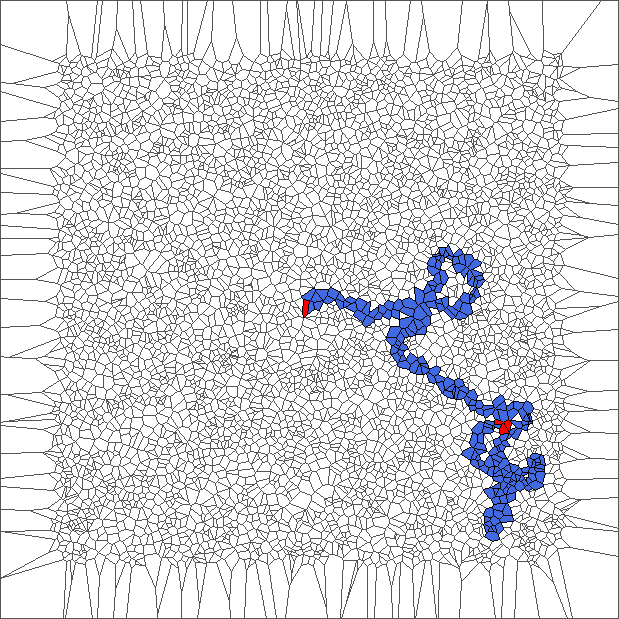 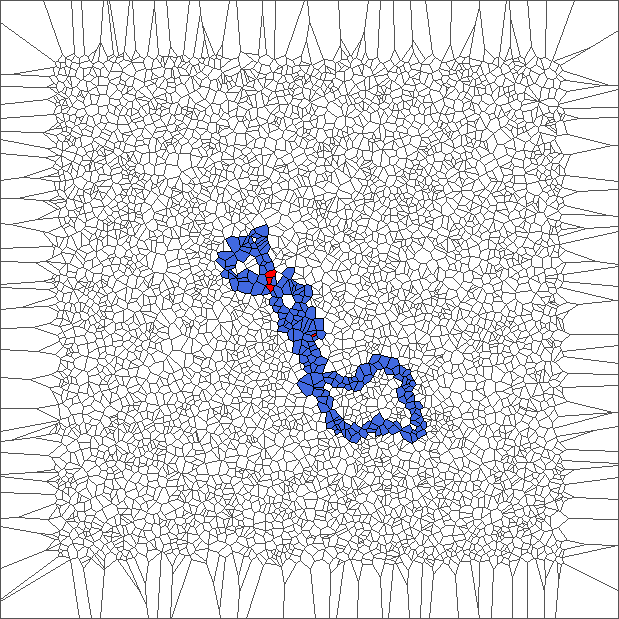 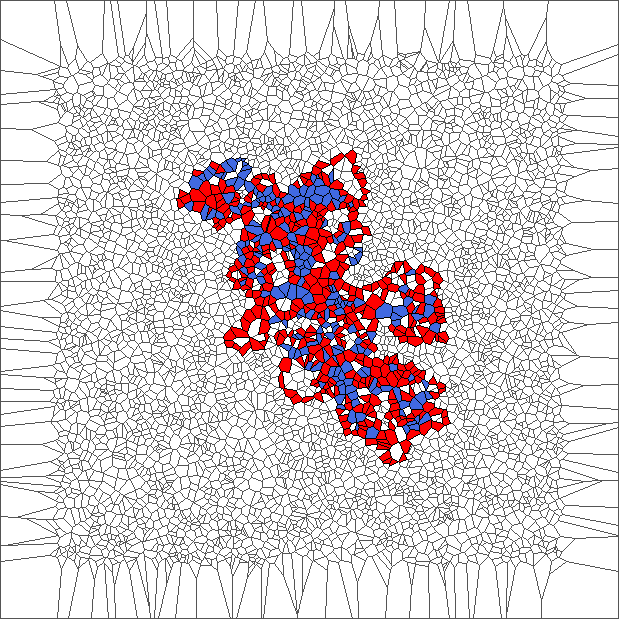 For each simulation of a trajectory, we sample 5000 points in a unit square from uniform distribution; Obtain a Voronoi tessellation from them; Define an initial configuration of the ant; And compute evolution during 1000 steps (or until reaching a border of the area). 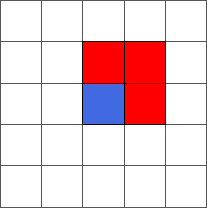 We plot 9 pictures for each rule SP, RL, SR and SL. 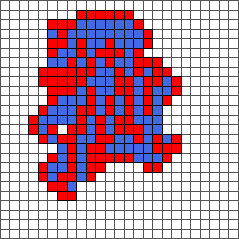 Each picture represents the state after the evolution. 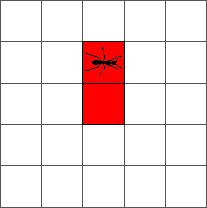 Those pictures help to understand the different kind of behavior of the ant. The ant circles forward and draws snake patterns. 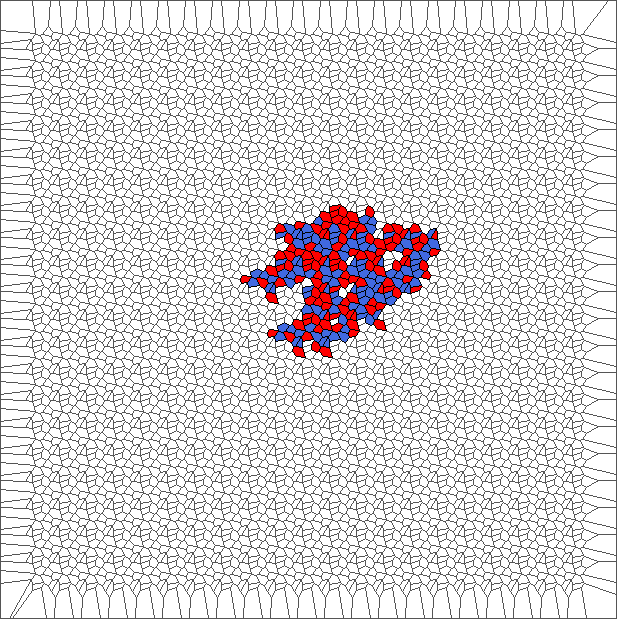 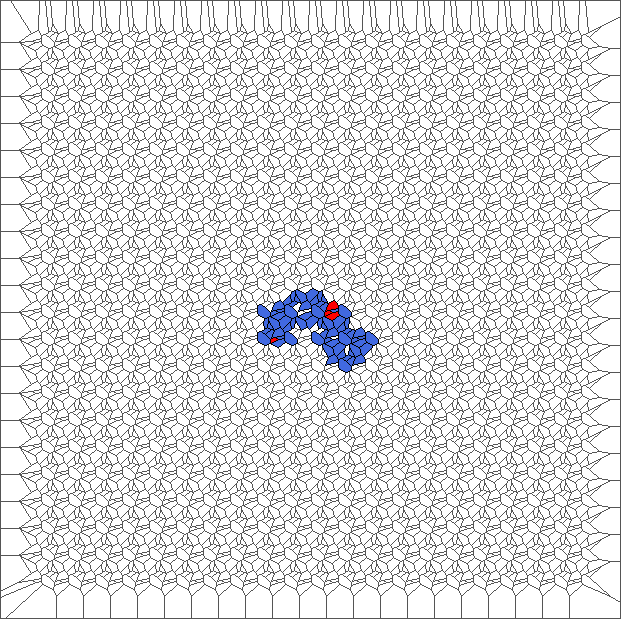 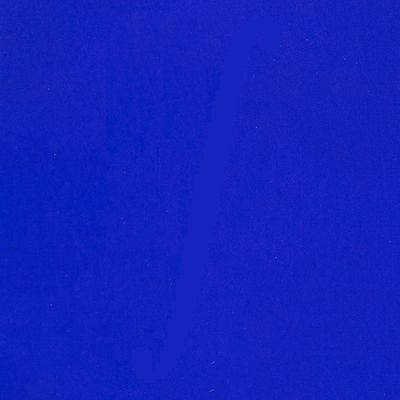 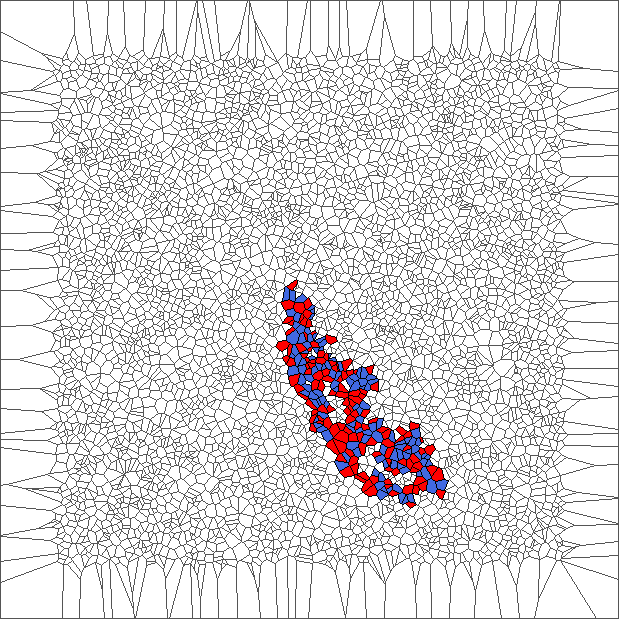 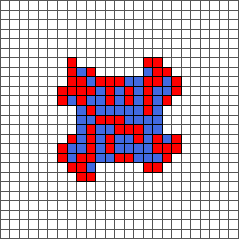 Cells where the ant has traveled are all in blue, except for the initial cell and for the last cells. 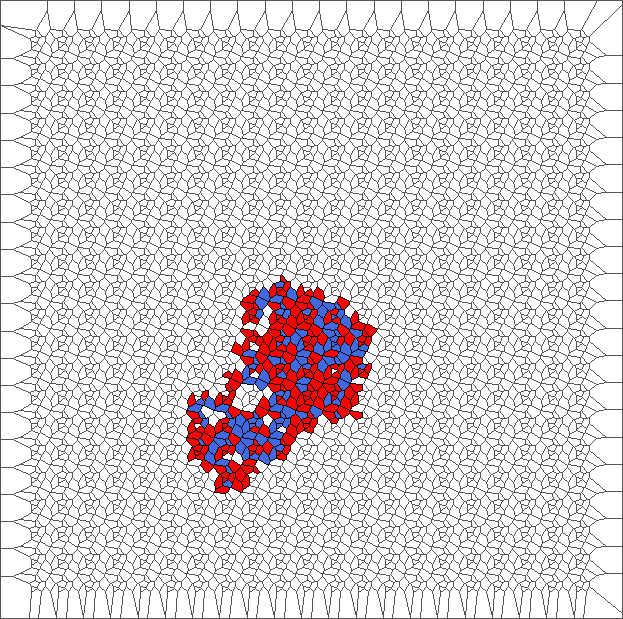 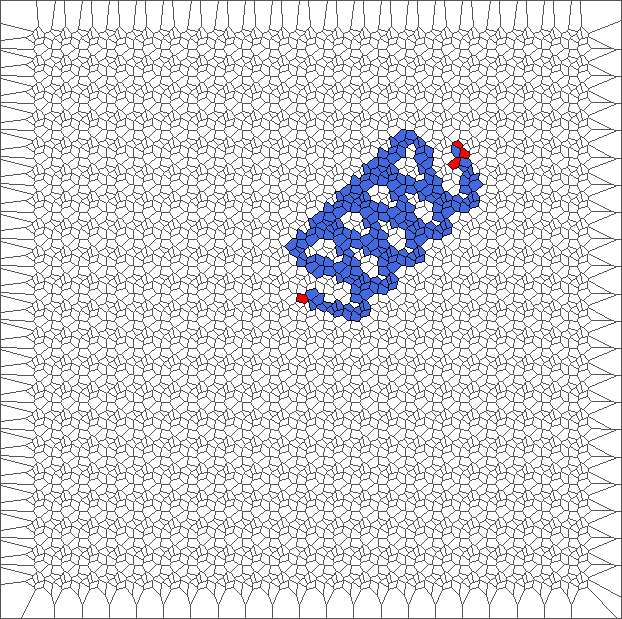 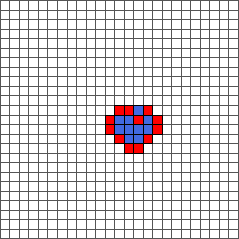 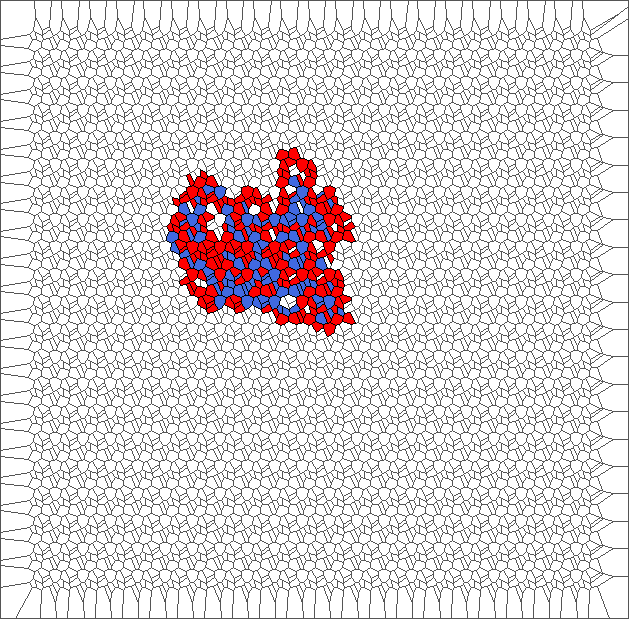 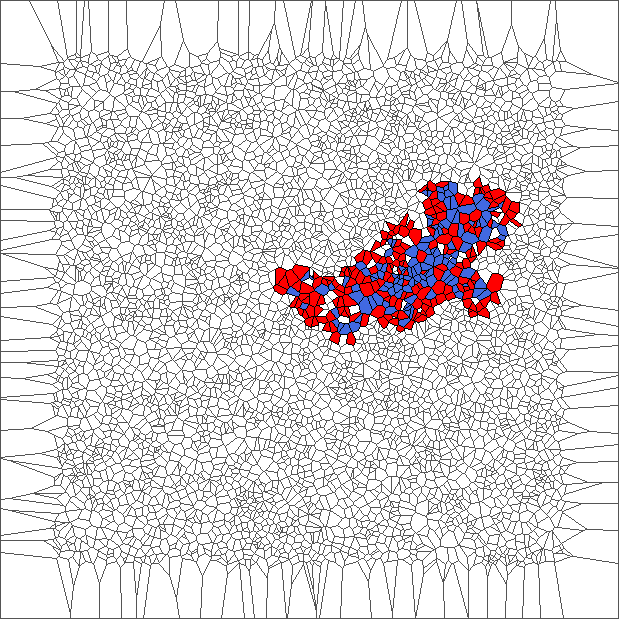 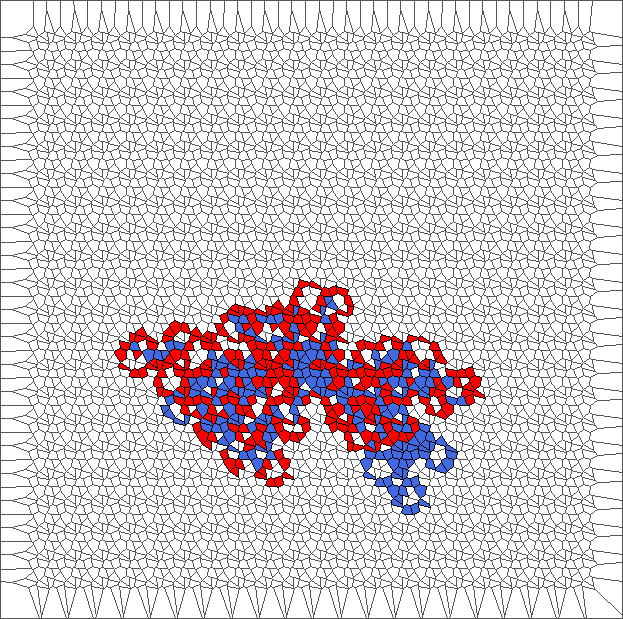 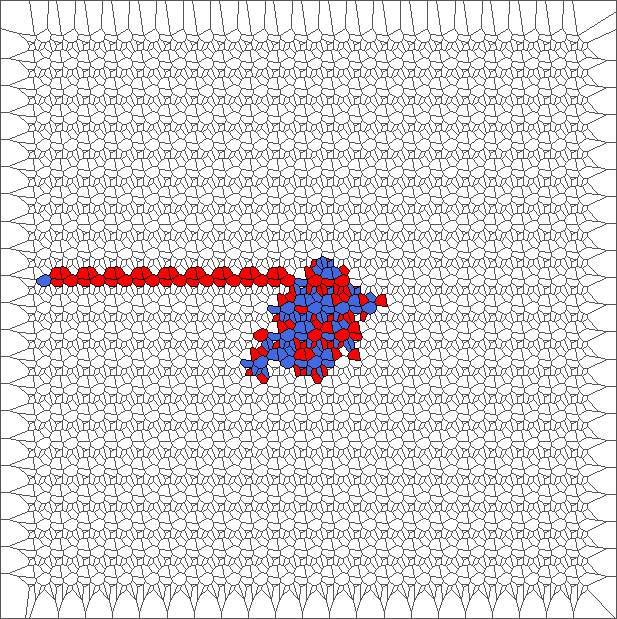 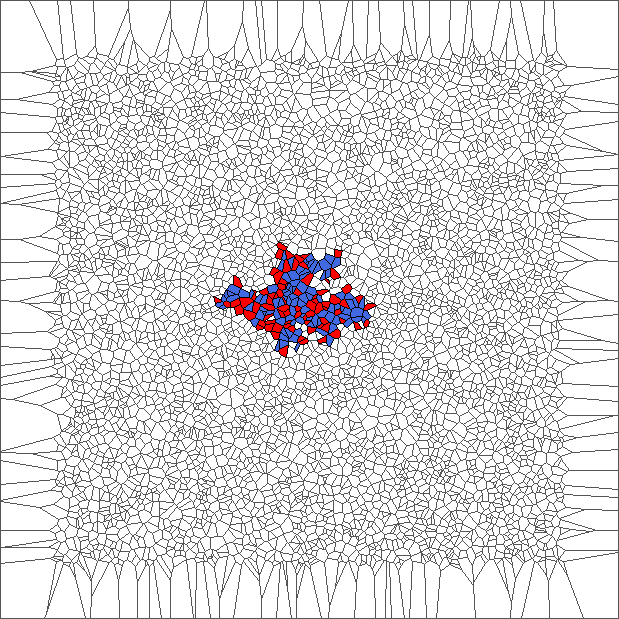 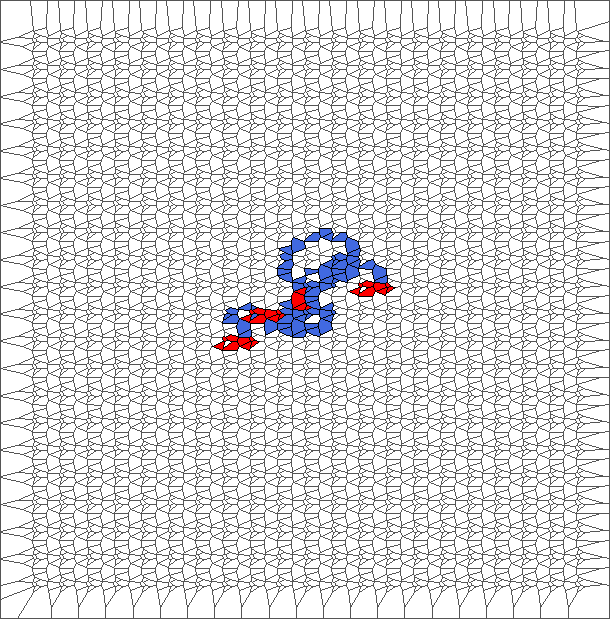 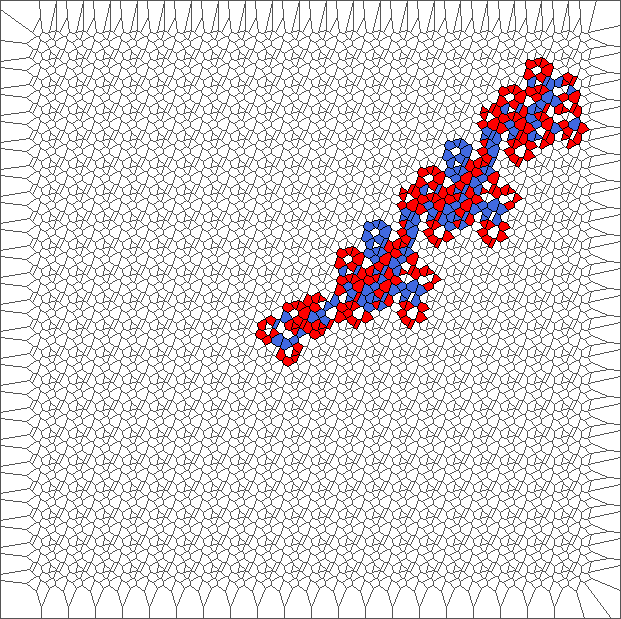 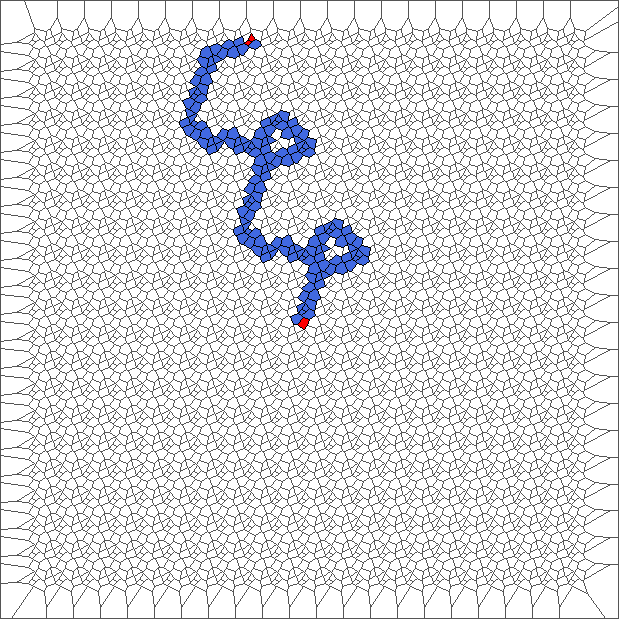 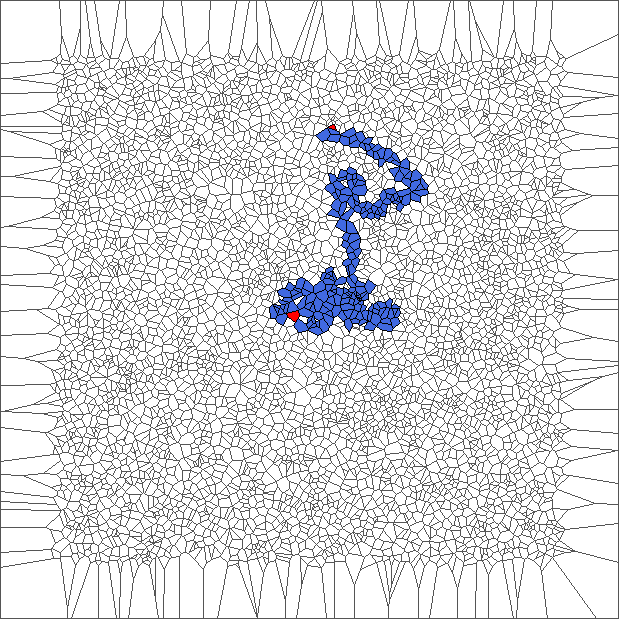 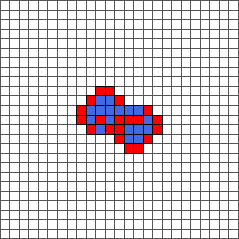 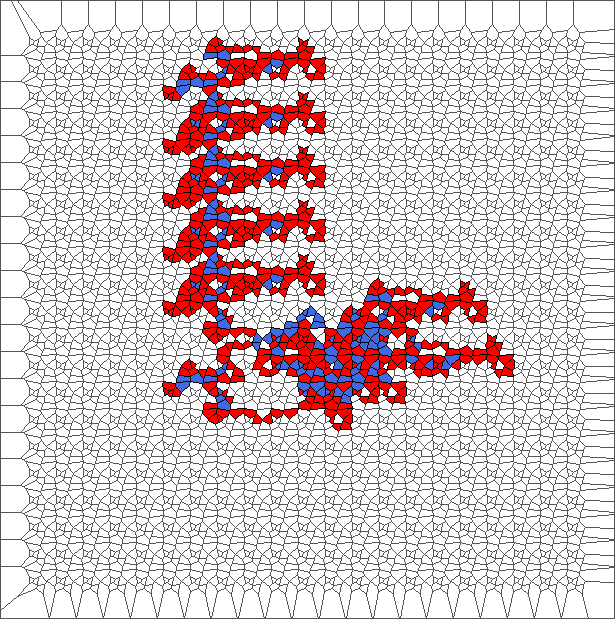 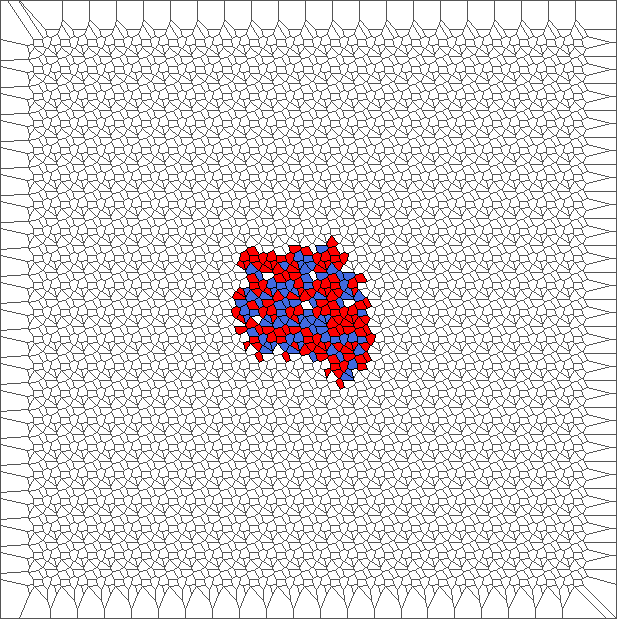 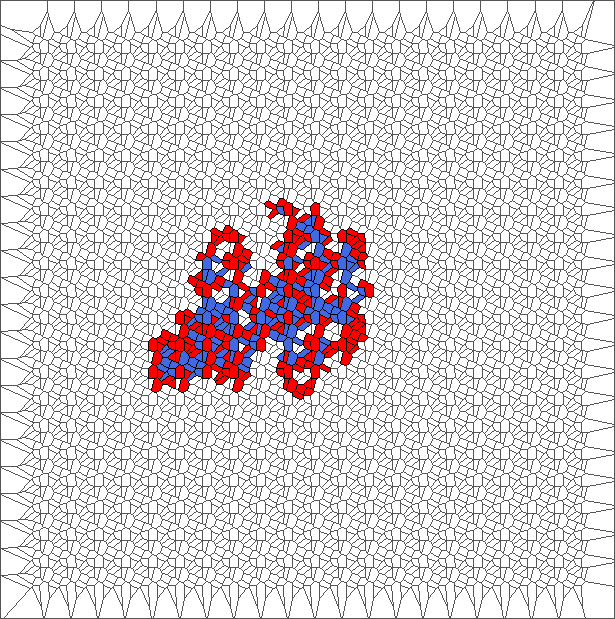 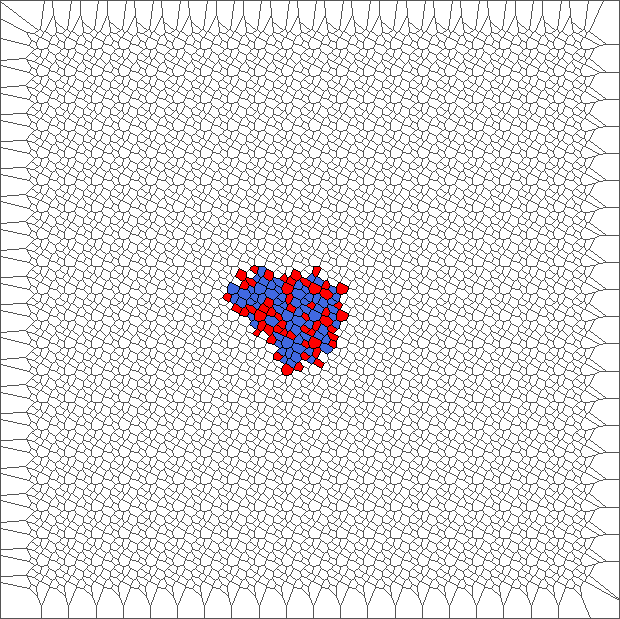 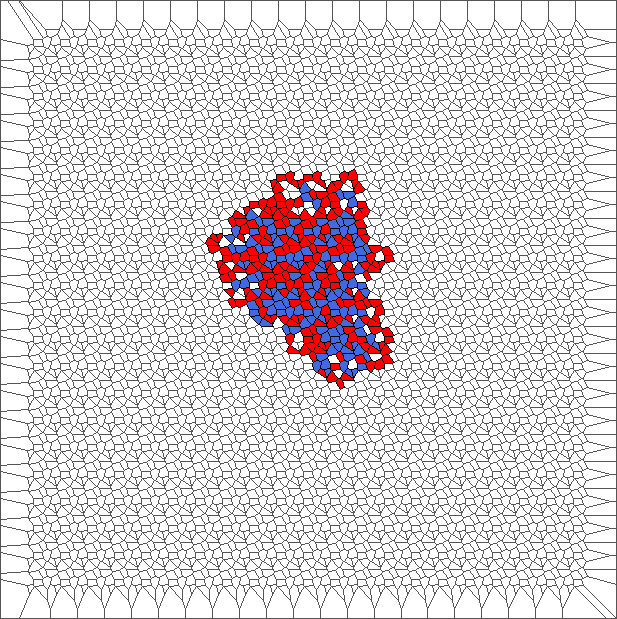 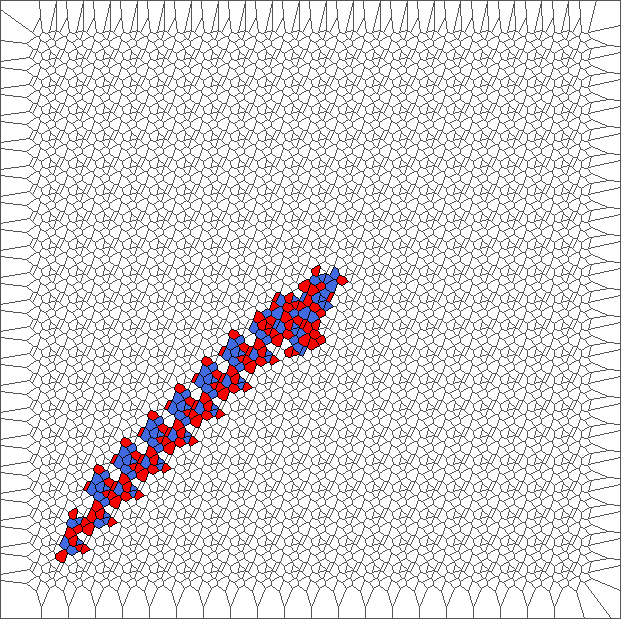 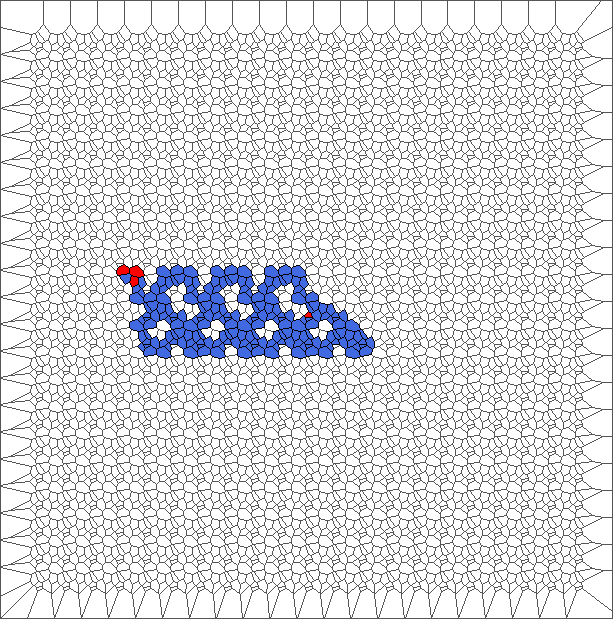 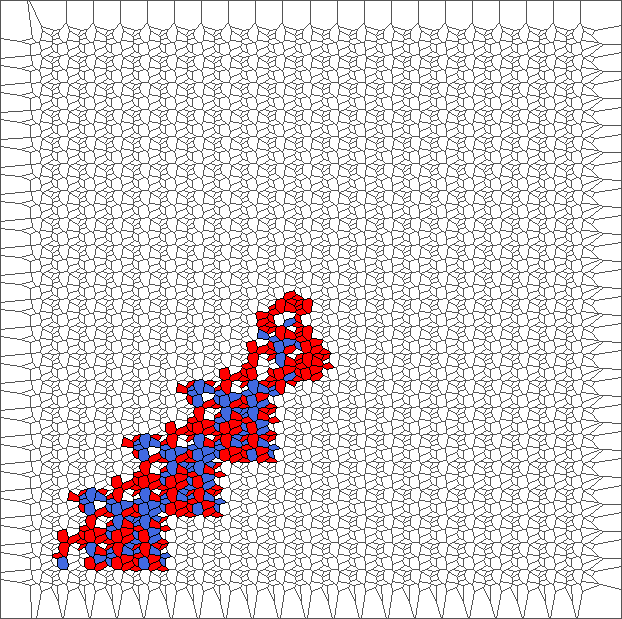 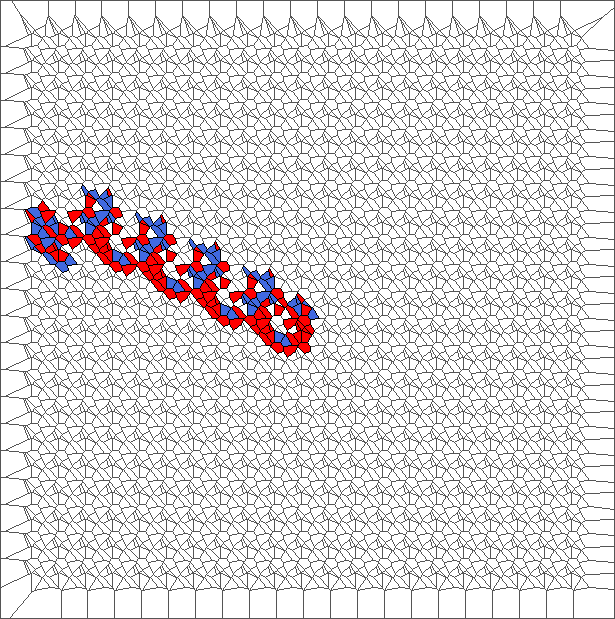 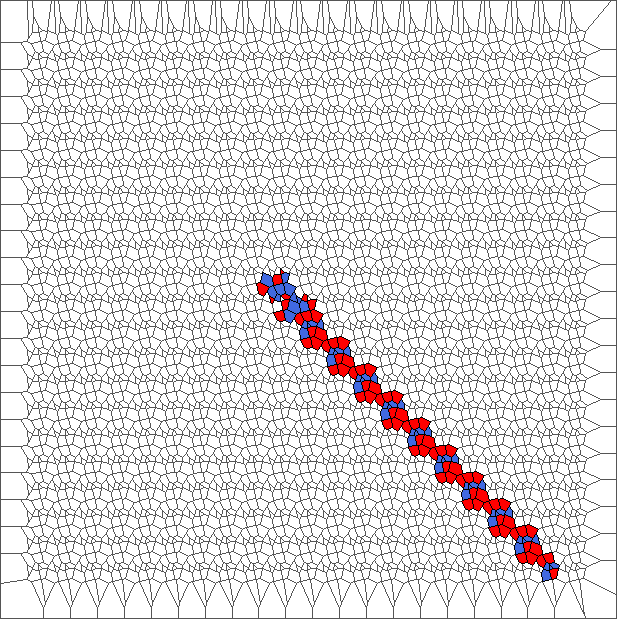 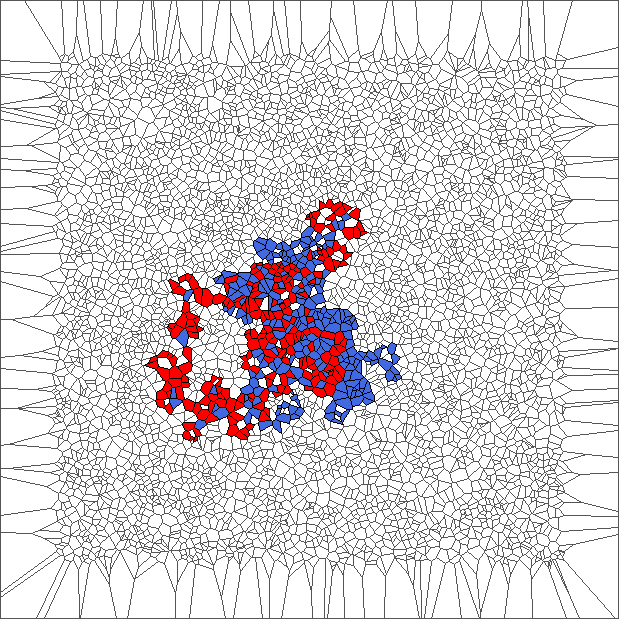 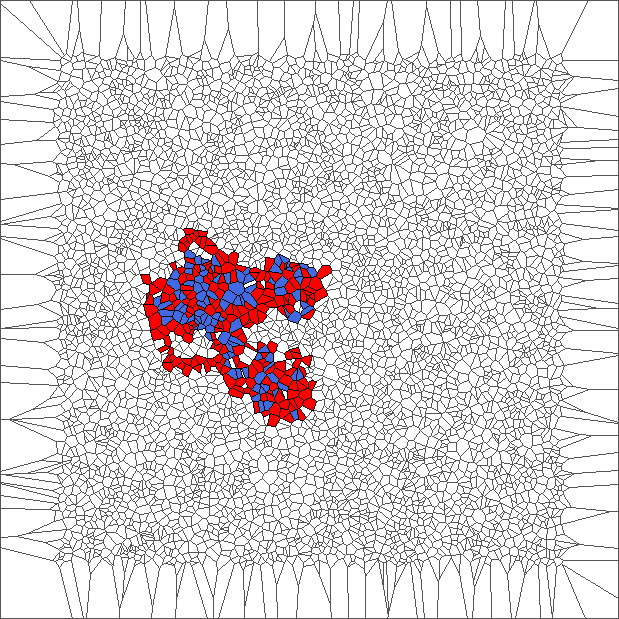 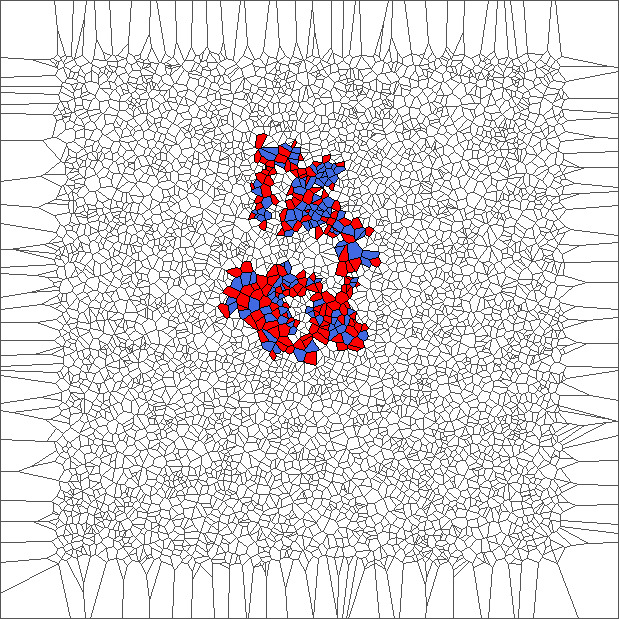 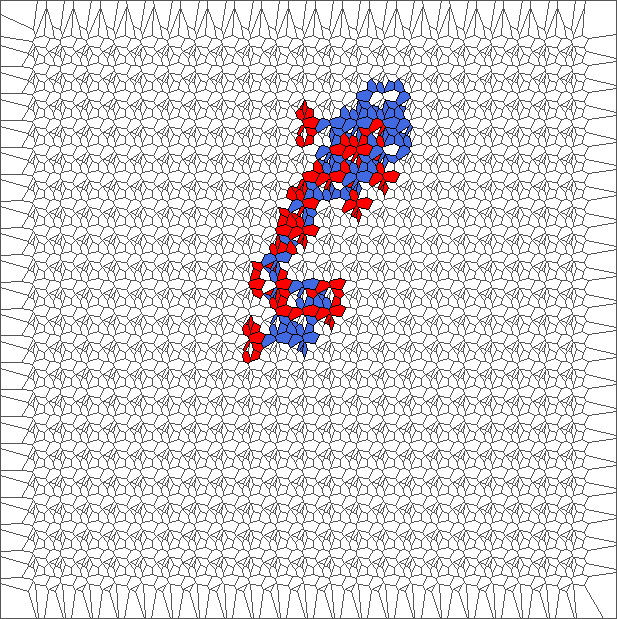 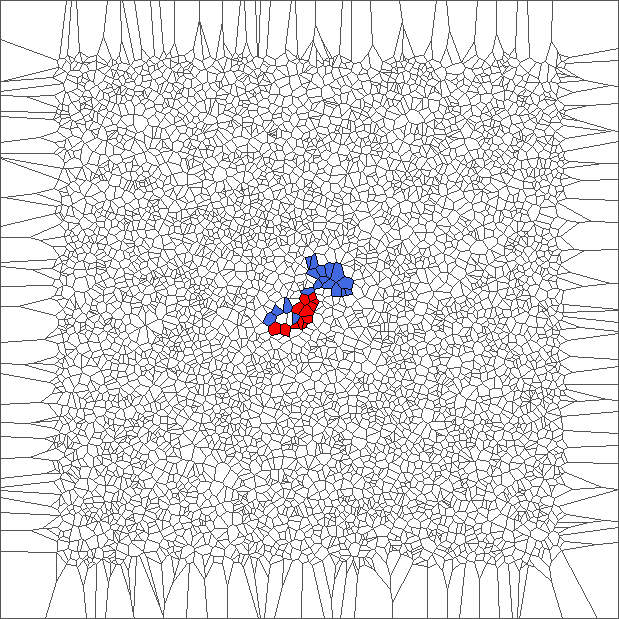 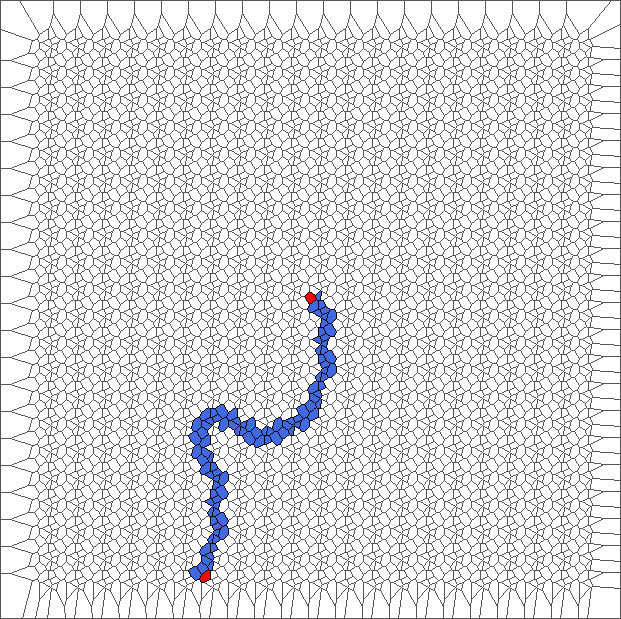 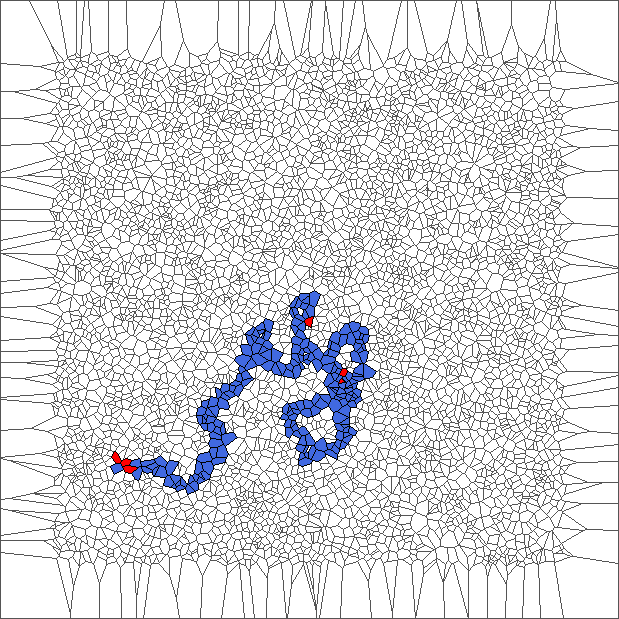 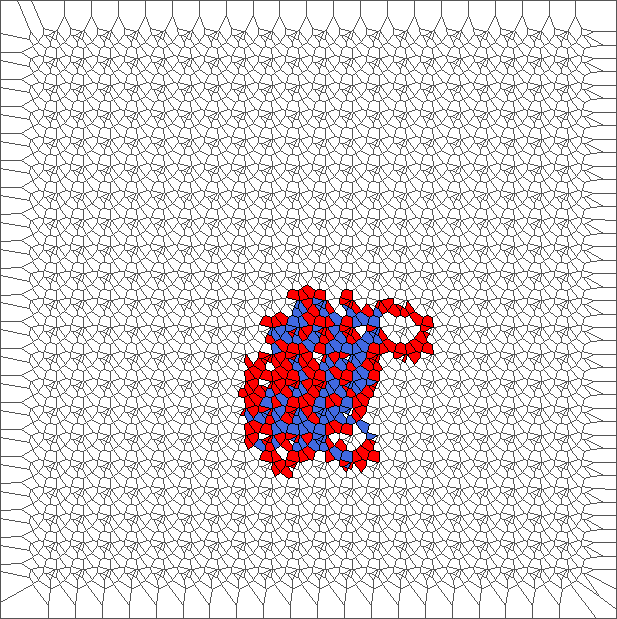 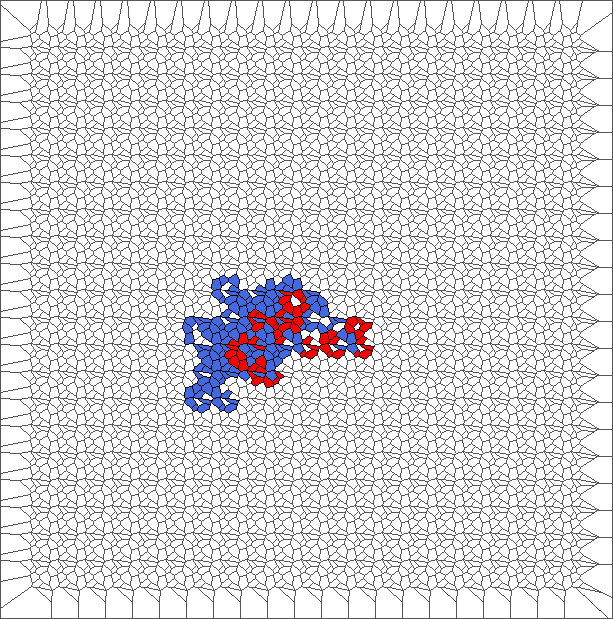 The ant initially makes circles and builds complex patterns (in red), before to backtrack a large part of the trajectory (in blue). This is caused by the symmetry between direction R and L, and can be shown through the large areas in red and blue. The ant really wants to turn to starboard, but makes a lot of chaotic circles, generally in an increasing area. 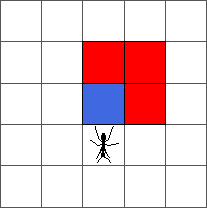 The rule is asymmetric but keeps balance between moving to the left and to the right. 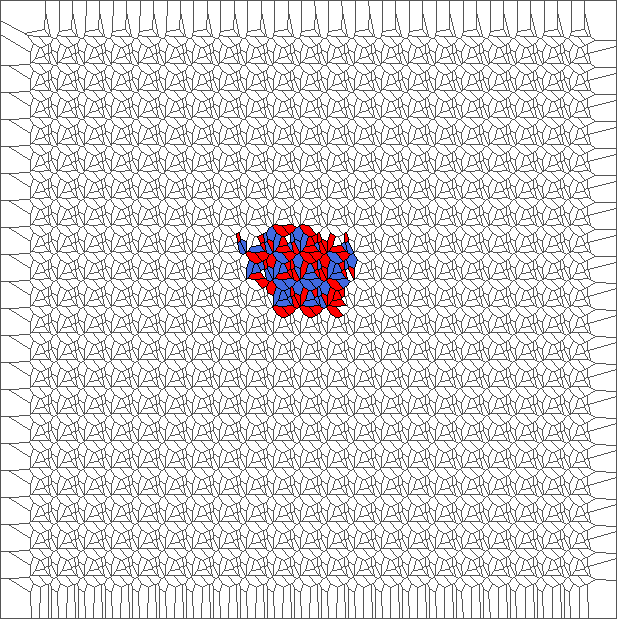 Pictures show chaotic trajectories. 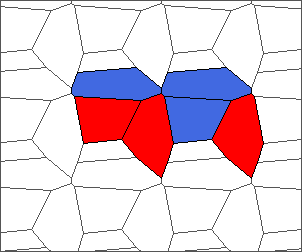 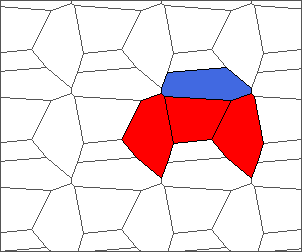 To simulate regular tilings, we sample a limited number of points in a unit square, translate these points in all directions, and obtain a Voronoi tessellation from them. 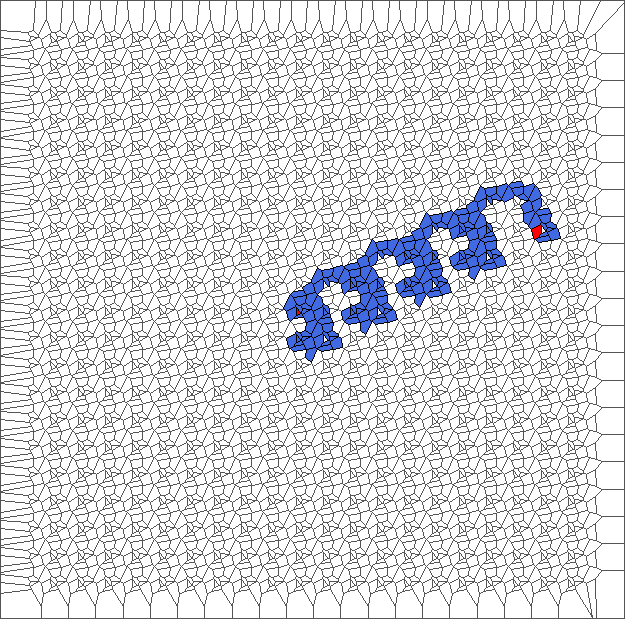 Then we proceed as in the last section. 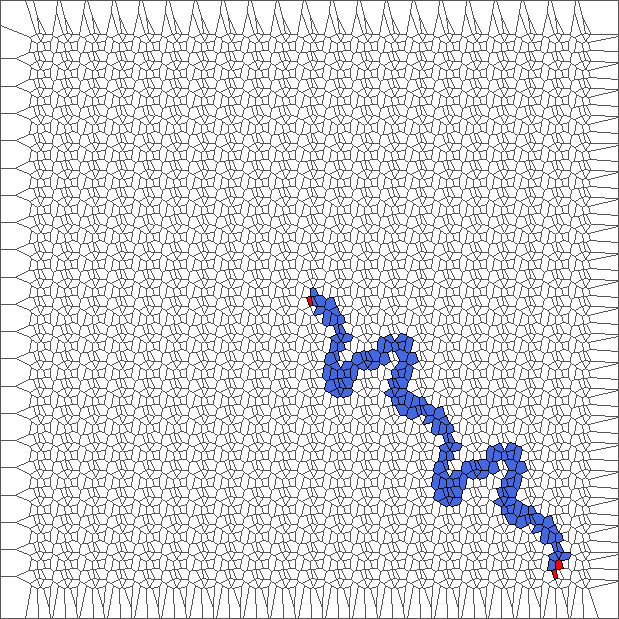 Trajectories exhibit three kinds of behavior: chaotic structures, highway patterns and bounded evolutions. 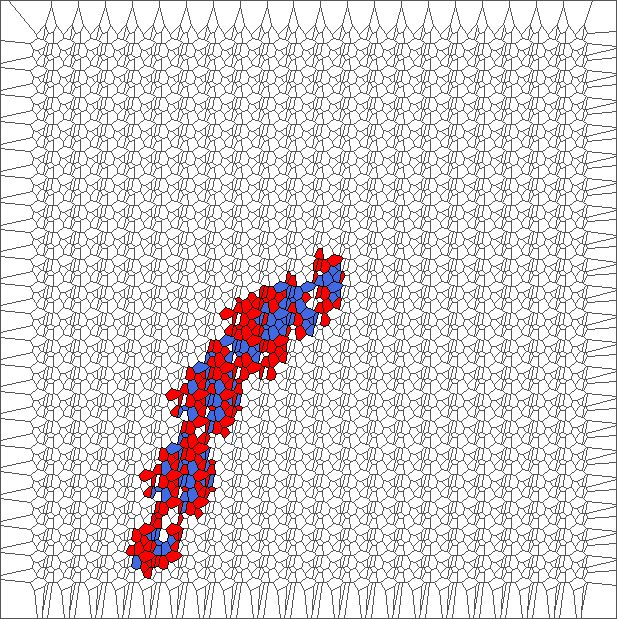 After computing trajectories for a lot of tilings, we observe that some evolutions are bounded. I like the previous version of SP48 because some figures appear such as a turtle, a pelican and a dog (can you see them?). 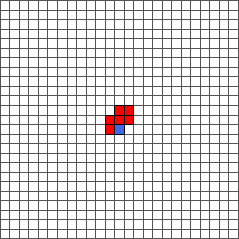 However, some edges are small to check. 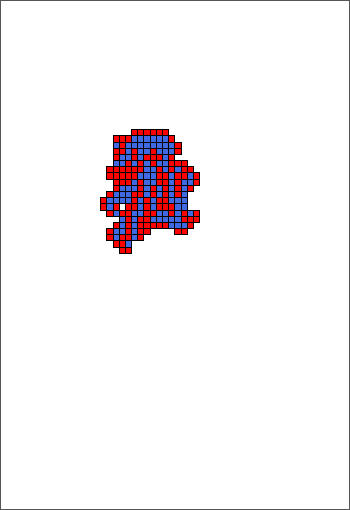 Here is a clear version of SP48. 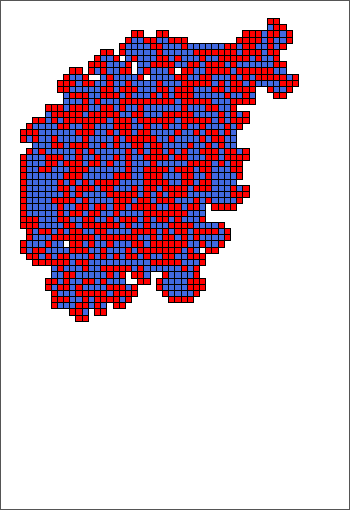 Some questions arise from this example: Can we get a number of steps lower than 48 for this rule? 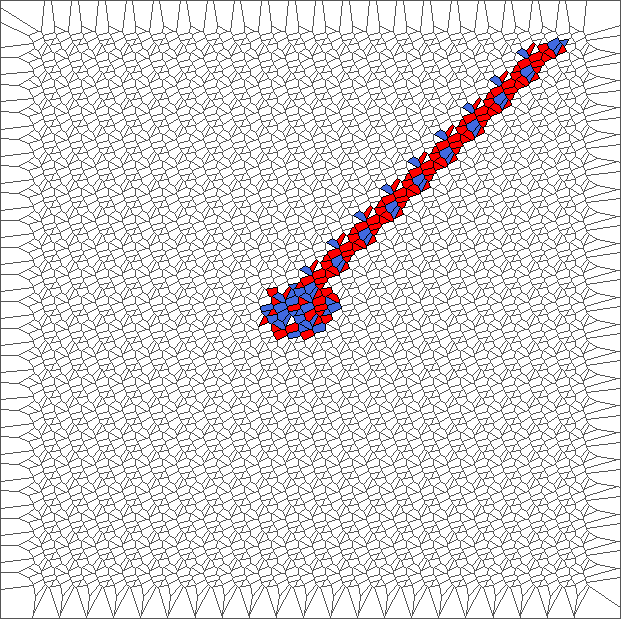 Can we get a bounded trajectory for all rules? 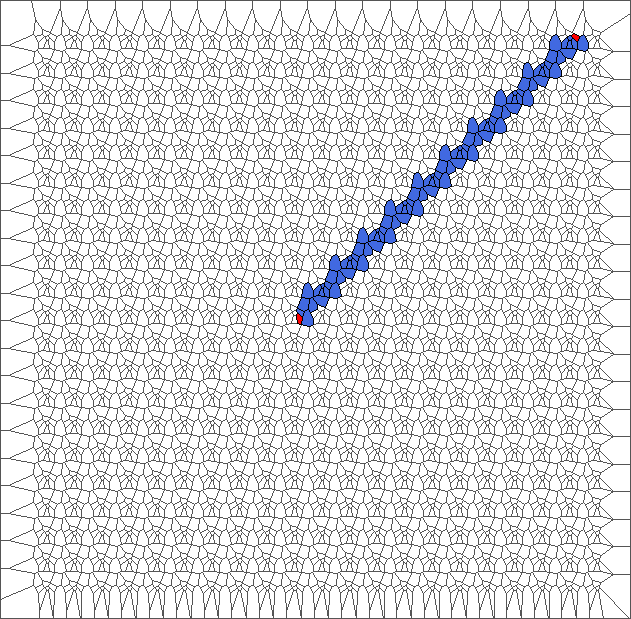 Front set of pictures shows a bounded trajectory describing a ring, computed with rule SP and plotted at steps 1, 10, 20, …, 90, 100, 200, …, 500. 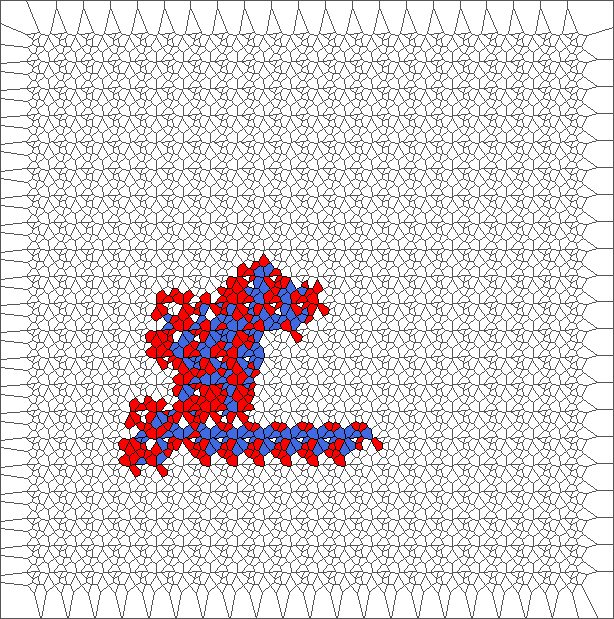 Experience hexagonal Langton’s ant online in this post of Bastian Reitemeier. 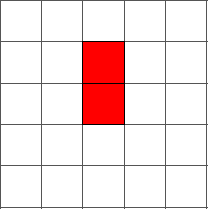 I took the same notations to name the directions. 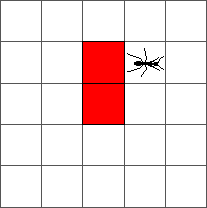 Wikipedia page describing Langton’s ant and some extensions.